28. Make Love to Me! Imagine a day when popular music consisted of lyrics which made sense, and actually said something. When music was built on great tunes, aided and abetted by arrangements of the highest order and vocalists who could really “sell” a song. 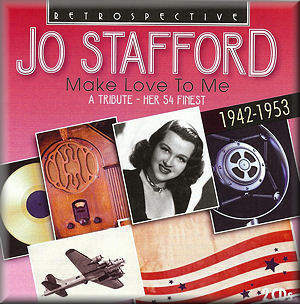 Jo Stafford was one of the finest singers around. I remember as a child hearing Shrimp Boats on the radio and thrilling to the energy and the excitement in the voice of the singer. Now I’m also aware of a harpsichord in the accompaniment. Stafford’s career lasted for 30 years – from the 1930s to the 1960s – starting with her sisters, Christine and Pauline in a vocal group, The Stafford Sisters, and when they married, Jo joined the 8 voice ensemble The Pied Pipers who were signed by Tommy Dorsey for his radio show. In 1944 Jo went solo and had a string of hits – she was the first female artists to have a number 1 hit in the UK singles chart. These two CDs give a very good impression of her art, and the selection of songs, and the programming, has obviously been undertaken with a lot of care. There’s well known tunes – Hugh Martin’s Walking My Baby Back Home, Victor Schwertsinger and Johnny Mercer’s I Remember You – later made famous in the 1960s by the yodeling Frank Ifield – Kurt Weill’s September Song and many more – and some of the best composers of the period are represented. The arrangements are very interesting for the arrangers have managed to transform some up–tempo numbers into very handsome ballads – Lerner and Loewe’s It’s Almost Like being in Love (from Brigadoon) – and there’s a few very funny C&W take–offs, at least I think they are take–offs, C&W cannot be meant to really be like this! Amazingly enough, Temptation (Tin–Tay–Shun) was issued under the name of Cinderella G Stump and was a number 1 hit! As always with these compilations there’s something for everybody. I was very taken with the gutsy Blues in the Night (a splendid arrangement by Sy Oliver and great support from Tommy Dorsey and his Orchestra) which starts the first disk, and Jerome Kern’s Long Ago and Far Away – what a song! – is given a slightly up–tempo performance which seems to add to the longing. Perhaps her version of September Song is unsatisfactory for it really is a man’s song – remember the pathos which Walter Huston brought to it – it was written for him – but Cole Porter’s In the Still of the Night is a lesson in how to deliver a love song with the utmost simplicity. Strafford recorded some of the best songs of the time and, although she had a limited vocal range and limited emotional response she could put a song across with a heartwarming effortlessness. Harold Arlen, Jerome Kern, Cole Porter, Arthur Schwartz and many others all gain from Stafford’s approach and I wish that there had been a few more real up–tempo numbers, like the aforementioned Shrimp Boats, for Stafford’s voice is really suited to this kind of material. But this is a small point. The transfers have been undertaken with great care and the sound is excellent. The notes are very good, detailing every song and who is playing in the accompaniments. This is an excellent reminder of perhaps not a great singer, but a very fine one and a superb artist. Don’t miss this one!